Richard B. (Rick) Berman is a former labor management attorney and restaurant industry executive who, with his firm Berman & Co., currently works as a Washington, D.C. lobbyist for the food, alcoholic beverage, tobacco industries and, more recently, other industries. Berman & Co. has lobbied for companies such as Cracker Barrel, Hooters, International House of Pancakes, Olive Garden, Outback Steakhouse, Red Lobster, Steak & Ale, TGI Friday's, Uno's Restaurants, and Wendy's. Berman has earned the nicknames "Dr. Evil," the "Conservatives' Weapon of Mass Destruction" and the "Astroturf Kingpin" for his repeated use of the strategy of forming dozens of non-profit front groups, attack-dog web sites, and alleged think tanks that defend his corporate clients' interests by attacking their critics, allowing his paying clients to remain out of public view. Berman & Co.'s many front groups work to counteract minimum wage campaigns, keep wages low for restaurant workers, and to block legislation on food safety, secondhand cigarette smoke, and drunk driving and more. Since 2013, Berman and his Employment Policy Institute "think tank" have led a national fight against campaigns to raise the minimum wage and to provide paid sick leave for workers with renewed attacks on proponents (including the Center for Media and Democracy, publisher of SourceWatch), misleading reports, op-eds, TV and radio ads, and more, as reported by the New York Times. The New York Times has also reported that he "receives millions of dollars from business" in order to wage these campaigns. Berman has also actively campaigned against any attempts to limit smoking in restaurants and bars. In testimony before the New York City Health Oversight Committee, Berman said, "The level of exposure to secondhand smoke for bartenders, waiters and waitresses is considerably lower than the federal air quality limits established by the federal government." Berman is the president, executive director, and board member of the Center for Organizational Research and Education (CORE, called the Center for Consumer Freedom/CCF until early 2014). In spite of its former name, CORE is more concerned about industry than the consumer. Berman is also the executive director and president of the Employment Policies Institute, the Employment Policies Institute Foundation, the American Beverage Institute, and the Center for Union Facts. Berman's company had 28 employees and took in $10 million dollars a year as of 2006, but "only Berman and his bookkeeper wife" know how much of the $10 million ends up in their own pockets, according to USA Today. 1 Bradley Foundation Ties, "Go-To Hire For Corporate Bullies"
Bradley Foundation Ties, "Go-To Hire For Corporate Bullies"
"According to the Bradley Files, Bradley has given Berman groups at least $6.5 million. Bradley gave Berman's "Employment Policies Institute," an organization that spreads misinformation about the effects of minimum wage increases and other workplace reforms, a total of $3,650,000 between 2009-2015; Berman's "Center for Consumer Freedom," a front group created to undermine public support for food-safety and animal welfare groups, $625,000 between 2009-2013; Berman's "Center for Union Facts," created to attack and undermine unions and collective bargaining, $2,240,000 between 2006-2015." "In addition, Bradley funds the "Capital Research Center" to work with Berman on projects. The Center is not part of the Berman operation, but is run by a former Berman employee, Scott Walter. It received $2.5 million from Bradley between 1998-2015." "While most of Berman's front groups are no more than a website, a few of them have been incorporated as non-profit "charitable" organizations. They may even have an employee attached to them and a specific focus, but as the New York Times detailed in 2016, employees are generally housed at the PR firm Berman and Co. and report to the boss, Rick Berman." "These "charities" serve the function of allowing groups like Bradley to send tax-exempt funds, which are then funneled into Berman's wholly-owned for-profit entity, Berman and Co., under the rubric of "management fees." This scheme has prompted Charity Navigator, an independent authority on charitable giving, to issue donor warnings on Berman front groups. It has also prompted serious complaints against Berman and Co. for abusing the tax code and engaging in activities for private benefit." "Bradley is bankrolling multiple Berman front groups along with groups across the nation that are working to "defund Big Labor" and to destroy unions, the most significant advocate for higher wages and better working conditions in America. Berman was caught on tape telling prospective funders: "I get up every morning and I try and figure out how to screw with the labor unions" and "marginalize the people on the other side," as CMD helped reveal in 2014." "The highly political nature of Bradley's efforts is underscored by Bradley grantees who boast in major newspapers and in Bradley-funded publications like the Daily Signal that the evisceration of public and private sector unions in states like Wisconsin and Michigan was successful in turning blue states red in the last presidential election cycle. Bradley even has a promotional video "Blue Lakes Red States," boasting of the success of its numerous grantees." "More recently, Bradley has funded another Berman front group to "expose Big Labor's strategies and tactics, including in the policymaking arena." Materials included in the Bradley files as examples of Berman's work are a series of print ads accusing teachers of treating kids like garbage and ads that liken teachers' unions to roach traps (Center for Union Facts, Grant Proposal Record, 1/10/2015)." "One of the projects funded by Bradley was the "Big Green Radicals.com" website, which attacks four effective environmental organizations, the National Resources Defense Council, Sierra Club, Greenpeace and Food and Water Watch. The website says it is a project of the "Environmental Policy Alliance" and does not disclose Berman's involvement. The Bradley files reveal for the first time that the foundation gave $150,000 to a Berman front group [CCF] to fund this website under the misnomer "public education" (Center for Consumer Freedom, Grant Proposal Record, 11/12/2013)." "In recent years, the site has been trashing environmental activists in Colorado. There has been a multi-year throw down between anti-fracking community groups battling it out against the oil and gas industry, and the national environmental groups have been lending a hand." ""Richard Berman is a go-to hire for corporate bullies. If the Bradley Foundation is paying groups to focus more on political bullying, it makes sense they would support Berman's attacks on environmental advocates," said Connor Gibson of Greenpeace's investigations team." Main article: Berman & Co.
Berman & Co., a Washington, DC public affairs firm owned by lobbyist Rick Berman, represents the tobacco industry as well as hotels, beer distributors, taverns, and restaurant chains. Berman & Co. has lobbied for companies such as Cracker Barrel, Hooters, International House of Pancakes, Olive Garden, Outback Steakhouse, Red Lobster, Steak & Ale, TGI Friday's, Uno's Restaurants, and Wendy's. Berman & Co. operates a network of dozens of front groups, attack-dog web sites, and alleged think tanks that work to counteract minimum wage campaigns, keep wages low for restaurant workers, and to block legislation on food safety, secondhand cigarette smoke, and drunk driving and more. In 2013-14, Berman and his Employment Policy Institute "think tank," have led a national fight against campaigns to raise the minimum wage and to provide paid sick leave for workers with renewed attacks on proponents (including the Center for Media and Democracy, publisher of Sourcewatch), misleading reports, op-eds, TV and radio ads and more. On May 12, 2016 Berman admitted to advising the controversial corporate giant Monsanto in an interview with the Cato Institute. "I’ve moved people to different points of view over time just by changing the language. You know, I often told Monsanto, I’ll just use one company’s position here, I often told Monsanto they made a very big mistake when they called genetically modified, GMOs, when they call them genetically modified organisms exactly that. Why would you call, why would you tell people it’s safe to eat genetically modified organisms? That’s not the first thing that you think of when you get out of bed in the morning, that I want some genetically modified organisms with my Cheerios. On the other, on the other hand, if they had just called these new foods that they were creating with science, if you call them genetically modified foods, or more importantly, genetically improved foods, so if you called them GIFs, genetically improved foods, rather than GMOs, you immediately would have had a different reaction on the part of the public. And so, I think you could have moved the needle enormously. It wouldn’t have gone so far south if you had just used different language." The U.S. Senate passed Amendment 838, "a non-binding amendment that called for the transfer of public lands, including National Forests, wildlife refuges and wilderness areas, to state control," on March 26, 2015. The 51-to-49 vote was mainly along party lines, with Senators Corey Gardner (R-CO), Kelly Ayotte (R-NH), and Lamar Alexander (R-TN) joining the Democrats in opposition. During the week of the vote, Will Coggins, a senior research analyst at Berman and Company, took out four nearly identical opinion pieces in Montana, Nevada, and Utah arguing strongly in favor of the transfer of public lands to the states while also attacking hunting and fishing groups as "green decoys." This coordinated public relations campaign suggests that Berman and Company is behind the movement to sell off public lands, AllGov reports. In response to the amendment's passage and the opinion pieces written by Berman and Company, Backcountry Hunters & Anglers Executive Director Land Tawney wrote, "Nationally, an organized, concerted movement is underway to sell off and limit access to America's public lands and waters. These are not merely the actions of a lunatic fringe. Now is the time to double down and fight back against this ill-conceived idea." Think Progress reports that "[l]egal scholars have noted that these so-called 'land transfer' schemes are unconstitutional, economic analyses have found them to be fiscally reckless, and sportsmen's groups argue that they would result in diminished public access for hunting and fishing." Toward the end of 2014 and into 2015, Berman, Newt Gingrich, and various Berman front groups began pushing Congress to pass the so-called "Employee Rights Act," a bill whose seven provisions are designed to further weaken unions and make it even harder for workers to organize. For example, on March 9, 2015, LaborPains.org, the joint blog of Berman front groups the Center for Union Facts and the Enterprise Freedom Action Committee, published a post encouraging Congress to pass the "Employee Rights Act," claiming a connection with Scott Walker's signing of a bill to make Wisconsin a so-called "Right to Work" state. The post followed months of opinion pieces taken out in major newspapers across the United States by Berman, Gingrich, Michael Saltsman, or various combinations of the three in support of the legislation. "In a recent Washington Post op-ed, right-wing lobbyists Rick Berman and Newt Gingrich urged the new Republican Congress to enact the ludicrously mistitled "Employee Rights Act" (ERA), a bill so reactionary it could have been penned by the Koch brothers themselves. In the name of 'protecting' employee rights, the ERA would make it extraordinarily difficult for workers to choose unions and would give a virtual pass to unscrupulous corporations that coerce and intimidate employees. While it won't become law while the Democrats control the White House, the ERA provides an illustration of the draconian legislation that Republicans will unleash on workers if they win control of both the presidency and the Congress in 2016." The Guardian uncovered in February 2015 that "Berman has secretly routed funding for at least 16 studies and launched at least five front groups attacking Environmental Protection Agency rules cutting carbon dioxide from power plants." The Berman front Employment Policies Institute funded the reports, which were carried out by the Beacon Hill Institute, an ALEC-allied member of the right-wing State Policy Network (SPN) headquartered on the campus of Suffolk University. The Beacon Hill Institute received $41,500 from the Employment Policies Institute to research the effects of the EPA rules. According to The Guardian, "The reports, claiming the power plant rules would lead to rolling blackouts, send electricity prices skyrocketing, and devastate local economies, are being published in 16 states by a network of pro-corporate and ultra-conservative thinktanks." The Guardian quoted Jay Duffy of Clean Air Task Force when it reported that the Beacon Hill Institute's research and analysis are not academically rigorous: "BHI's interpretation of EPA's analysis just doesn’t hold up... BHI has skewed timelines, underestimated the social cost of carbon, and overestimated the effect on electricity prices. As a result, their study badly inflates the costs and minimises the benefits of EPA’s draft rules." Read more about this story on CMD's PRWatch here. On October 30, 2014, the New York Times broke the news that a speech Rick Berman had given to oil and gas executives at an event sponsored by the Western Energy Alliance in Colorado Springs in June 2014 had been secretly taped, and that Berman told those gathered that "if the oil and gas industry wants to prevent its opponents from slowing its efforts to drill in more places, it must be prepared to employ tactics like digging up embarrassing tidbits about environmentalists and liberal celebrities." Attendees included representatives from Anadarko Petroleum, Halliburton Company, ExxonMobil, Devon Energy, and Noble Energy. Berman told the executives they "must be willing to exploit emotions like fear, greed and anger and turn them against the environmental groups. And major corporations secretly financing such a campaign should not worry about offending the general public because 'you can either win ugly or lose pretty,' he said. 'Think of this as an endless war,' Mr. Berman told the crowd... 'And you have to budget for it,'" according to the Times. Bloomberg also reported on the leaked audio, noting that "Berman offered companies a way to anonymously target their environmental foes -- at a cost of as much as $3 million." Bloomberg spoke to Pennsylvania’s former top natural-gas regulator Michael Krancer, who said that industry supporters have no choice but to take Berman's advice and play dirty: "There is an anti-fossil fuel movement, and a very well-funded lobbying campaign is behind it," he told Bloomberg. "These are people who want to live in a dream world." "Screw" your enemy. Berman boasted about his obsession with unions and his attack on their efforts to raise the minimum wage for American workers: "I get up every morning and I try and figure out how to screw with the labor unions." Listen to this clip here. "Marginalize" your opponents. Berman described his tactics against public interest groups: "wherever possible I like to use humor to minimize or marginalize the people on the other side." Listen to this clip here. "Demolish the moral authority" of powerful public interest voices: "I got George McGovern to come out and say that unions were wrong. I represent some alcohol companies, I got Candy Lightner, who started Mothers Against Drunk Driving, to come out and say that MADD was overreaching and that she endorsed our position, our client position, rather than the MADD position. That is a demolishing of moral authority." Listen to this clip here. "Make it personal." Berman's associate Hubbard described how they go after concerned citizens who dare to challenge their clients: "we do have a section on every single activist. Their rap sheets, their criminal records they have. We’re really making this personal. We’re trying to make it so they don't have any credibility with the public, with the media, or with the legislators." Listen to this clip here. "Brand" whole movements as "not credible." Berman & Co. detailed their game plan to try to marginalize people concerned about fracking, as noted by Bloomberg media: "what we wanted to do is that we wanted to brand the entire movement behind this as not being credible, and anti-science." Listen to this clip here. Being "nasty" wins. Berman shakes off concerns that his activities are too nasty or aggressive, saying "you can either win ugly or lose pretty." Listen to this clip here. Push "fear and anger." Berman talked about pushing people's emotional buttons on fear, love, anger, greed, and sympathy, stating: "you could not get into people's heads and convince them to do something as easily as you could get into their hearts or into their gut to convince to do something. Because, emotions drive people much better than intellectual epiphanies." Listen to this clip here. Treat public policy as "endless war." Berman recognized that the public interest groups are appealing to the American people: "If you think about it these groups, the Sierra Club, who is the natural enemy of the Sierra Club? Who is the enemy of Greenpeace? You know at the surface, you would love to be a group like that because everyone should be in favor of you, who could be against you? That’s very difficult to over come and they play on that, and they trade on that, and that's our opportunity and also our challenge. So it is an endless war." Listen to this clip here. Give corporate cash "total anonymity." Berman reassured his audience that he can keep their role in these tactics secret: "We run all of this stuff through nonprofit organizations that are insulated from having to disclose donors. There is total anonymity. People don't know who supports us. We've been doing this for 20 something years in this regard. And to the degree to anybody is concerned about that I will tell you there are all sorts of ways, all sorts of firewalls that have been established to get this done on an anonymous" basis. He added: "I am religious about not allowing company names to ever get used. At least I'm not going to allow them to get used. And I don't want companies to ever admit that because it does give the other side a way to diminish our message." Listen to this clip here. Tear down celebrities who speak out. Berman's associate Hubbard noted that taking down celebrities who speak up is a key part of their strategy because: "the problem is that the public really does have a celebrity worship culture. But the good news is that there is nothing the public likes more than tearing down celebrities and playing up the hypocrisy angle." Listen to this clip here. "I get up every morning and I try to figure out how to screw with the labor unions -- that's my offense." "If you want a video to go viral, have kids or animals... Use humor to minimize or marginalize the people on the other side." "There is nothing the public likes more than tearing down celebrities and playing up the hypocrisy angle." "People always ask me one question all the time: 'How do I know that I won’t be found out as a supporter of what you’re doing?' We run all of this stuff through nonprofit organizations that are insulated from having to disclose donors. There is total anonymity. People don’t know who supports us." "They characterize us in a campaign as being the guys with the black helicopters. And to some degree, that's true. We’re doing stuff to diminish the other sides' ability to operate." Although Berman used to fly under the media radar, he has since been the subject of a 2007 60 Minutes piece that dubbed him "Dr. Evil," a public takedown on the Rachel Maddow Show, and years of research documenting his close ties to industries looking for a well paid hired gun to defend the indefensible. He has attacked respected scientists and scholars, food safety experts, and even Mothers Against Drunk Driving (MADD). Despite this documented dearth of credibility, Berman continues to work through a variety of research-for-hire front groups to remain relevant by creating a façade of academic respectability for extreme policies that many mainstream companies, scientists, and voters have rejected. Berman has raised millions of dollars from companies, trade associations, and individuals, but refuses to name them. According to the National Journal, the Employment Policies Institute was started "by a group of restaurant companies" that at the time (1995) got "95% of its budget from corporate sources -- primarily restaurateurs and retailers." Several years ago, an unnamed former Berman employee revealed a list of Berman's 2001-2002 corporate funders, including Coca-Cola, Cargill, Monsanto, Tyson Foods, Wendy's, Outback Steakhouse, and Applebee's. "We always have a knife in our teeth," Berman has said, and his approach is "to shoot the messenger." Restaurant industry spokespeople have praised his "outstanding work as an industry Doberman." 60 Minutes called him "the booze and food industries' weapon of mass destruction." Before striking out in 1986 with his own consulting company, Berman worked as a lawyer for Bethlehem Steel and Dana Corporation (1967-72), as labor law director for the U.S. Chamber of Commerce (1972-74), and for the late Norman Brinker's restaurant empire (Steak and Ale and the Pillsbury Restaurant Group, 1975-86). Berman & Company now has about 30 employees and runs the Employment Policies Institute and a number of other industry-backed secretive front groups such as the Center for Consumer Freedom, Center for Union Facts, and American Beverage Institute. Berman has had a long association with the National Restaurant Association and frequently worked together with its former lobbyist Lee Culpepper in the 1990s. Rick Berman created the Employment Policies Institute (EPI) in 1991 to "argue the importance of minimum wage jobs for the poor and uneducated." The Employment Policies Institute (EPI) is headed by Richard Berman, according to tax filings. It shares the same office as Berman's PR firm and it funnels money to the PR firm, as the New York Times reported in a front page story in 2014: "the Employment Policies Institute has no employees of its own. Mr. Berman's for-profit advertising firm, instead, 'bills' the nonprofit institute for the services his employees provide to the institute. This arrangement effectively means that the nonprofit is a moneymaking venture for Mr. Berman, whose advertising firm was paid $1.1 million by the institute in 2012, according to its tax returns, or 44 percent of its total budget, with most of the rest of the money used to buy advertisements." In 2013-2014, EPI has become a primary industry attack dog, fighting minimum wage as dangerous to the economy, fighting living wages and advocating a low road economic development policy. In September 2014, EPI started an ad campaign in Kentucky against raising the minimum wage, comparing his "false claims" on minimum wage to "broken promises on health care," and ran an ad in Politico calling President Obama and "his labor union supporters... misleading" for saying "there's no solid evidence that a higher minimum wage costs jobs." In February 2014, EPI ran a full-page ad in the New York Times attacking the over 600 economists who publicly favor raising the minimum wage to $10.10 an hour, who had been referenced by President Barack Obama, Senator Tom Harkin (D-IA), and the New York Times editorial board. The ad said, "Many of the 600 economists you rely on are radical researchers or full-time employees working at union-backed groups. Of those who support a higher minimum wage, 45 percent don't specialize in labor economics." An article published by Businessweek the same day pointed out, "The vast majority of the letter's signers, organized by the labor-backed Economic Policy Institute, are in the mainstream of the profession. They include some of the most prominent living economists, including seven Nobel Prize winners and eight former presidents of the American Economic Association." Then in March 2014, EPI started running a commercial attacking the minimum wage. The group planned to spend between $500,000 and $1 million on an "educational campaign" on the minimum wage, CNN reported in February 2014. The Employment Policies Institute (EPI) calls itself a "non-profit research organization dedicated to studying public policy issues surrounding employment growth." In reality, EPI's mission is to oppose any increases in the minimum wage so that restaurants can continue to pay their workers as little as possible, according to CNN. EPI also owns the internet domain names to MinimumWage.com and LivingWage.com, websites that attempts to portray the idea of a living wage for workers as some kind of insidious conspiracy. "Living wage activists want nothing less than a national living wage," it warns. In February 2014, EPI ran a full-page ad in the New York Times attacking the over 600 economists who publicly favor raising the minimum wage to $10.10 an hour, who had been referenced by President Barack Obama, Sen. Tom Harkin (D-IA), and the New York Times editorial board. The ad said, "Many of the 600 economists you rely on are radical researchers or full-time employees working at union-backed groups. Of those who support a higher minimum wage, 45 percent don't specialize in labor economics." An article published by Businessweek the same day pointed out, "The vast majority of the letter's signers, organized by the labor-backed Economic Policy Institute, are in the mainstream of the profession. They include some of the most prominent living economists, including seven Nobel Prize winners and eight former presidents of the American Economic Association." For several years, Berman fought efforts by the voter registration/community organizing group ACORN (Association of Community Organizations for Reform Now) to raise the minimum wage at the state and federal levels. To assist with his efforts, Berman created a Web site, www.rottenacorn.com, slamming the group. Contact information on RottenACORN.com directs readers to the Employment Policies Institute, a Berman front group which shares the same address as Berman's lobbying business, Berman & Company. 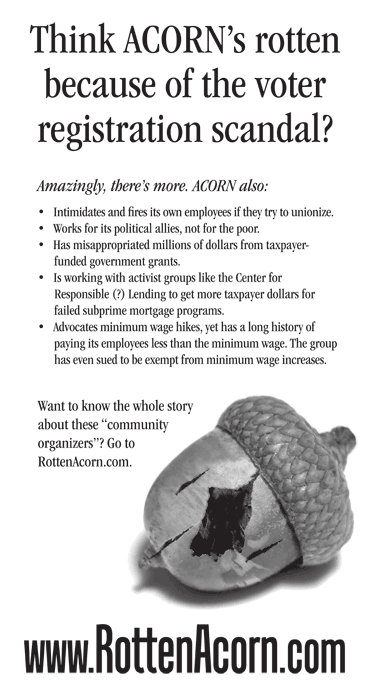 In the fall of 2008, prior to the general election, a full-page, anti-ACORN ad appeared in the New York Times that accused ACORN of a list of abuses that would make the group appear hypocritical: intimidating and firing its own employees when they try to unionize, misappropriating millions of dollars from taxpayer-funded government grants and advocating minimum wage hikes while paying its own employees less than minimum wage. The ad did not indicate what person or organization had funded it.In an October 29, 2008 article, the investigative journalism group ProPublica revealed that the ad and the Web site "RottenACORN.com" are funded by Rick Berman's Employment Policies Institute, which has among its clients, the American Beverage Institute, a trade group for bars and restaurants. As head of the Center for Consumer Freedom (CCF), a front group for the restaurant, tobacco, and alcohol industries, Berman has specialized in the no-holds-barred intimidation tactics pioneered by Big Tobacco. Berman confirms that organizations like his, by keeping their corporate sponsors anonymous, can engage in edgier PR by providing safe shelter for individual corporations: "There's no doubt about that. Most trade associations try to insulate individual companies and brand names from cutting-edge rhetoric." In 2000, the Center for Media and Democracy found that Berman and Co., Inc. was paid $256,077 by CCF for "management services," although CCF did not report paying any income to any of its employees. Berman has written a number of strategically placed op-ed articles in leading newspapers on behalf of CCF. On August 26, 2004, for example, the Atlanta Journal-Constitution printed "Soft Drink Hysteria Hard to Swallow," in which Berman trashed a study published that week in the Journal of the American Medical Association that showed a clear connection between soda consumption and diabetes: "Frankly, the contortions that the authors went through to demonize soda would make our own gold medal gymnasts proud." "And now, thanks to our outsized effectiveness in relation to our relatively small budget, he's targeting us. "We're honored to be called one of the 'Big Green Radicals' by notorious corporate lobbyist Rick Berman through his apparent latest astroturf operation, the Environmental Policy Alliance, a 'project of the Center for Organizational Research Education.' Ever heard of it? We hadn't either. After doing a bit of digging, we found out that the Center for Organizational Research Education was recently known as the Center for Consumer Freedom led by the head of Berman & Co. -- Rick Berman." Berman's history of industry spin and deceit is a long one. A new report by Citizens for Responsibility and Ethics in Washington (CREW) shows how Berman & Company misled the public regarding the health risks of indoor tanning, leading to an Federal Trade Commission (FTC) crackdown on his clients. In 2007, the Indoor Tanning Association (ITA) hired Berman and Co. to counteract new research documenting the adverse health effects linked to indoor tanning beds and new legislation restricting tanning bed access. Berman used a long standing front group called Center for Consumer Freedom to run misleading op-eds to distort science behind the cancer-linked tanning beds. In 2010, the FTC announced it would charge the ITA for violating FTC rules against deceptive advertising, and the suit was later settled. According to the American Academy of Dermatology and the World Health Organization, indoor tanning heightens the risk of developing dangerous skin cancers as much as 59 percent. Now that the FDA has announced stricter rules for tanning beds, especially to protect vulnerable teens, get ready for more Berman spin on the topic. In an October 9, 1989 commentary for Nation's Restaurant News, Berman opposed the passage of the Americans with Disabilities Act ("ADA"). He wrote, "The ADA in its present form will cost our industry untold millions in added construction and labor costs" He begins the article with a reference to the ADA and AIDS. He stated, "Congress ... is seriously considering passage of a new law that would require employers to ignore AIDS infections among cooks and servers . In the early 1990s, Berman was tied to former Speaker of the House Newt Gingrich through possible ethics violations involving Gingrich's PAC (GOPAC). In 1993, Berman made a $25,000 contribution to Kennesaw State College for Gingrich's class on "Renewing American Civilization" on condition that Gingrich teach ideas supported by Berman's Employment_Policies_Institute_Foundation. House Ethics Committee reports revealed that Berman's contribution was solicited by GOPAC and that Berman had already helped GOPAC in recruiting big donors. In the cover letter to the check, Berman thanked Gingrich for his "help" in enabling Berman to testify at a Congressional hearing on another matter of interest to the industry. Rick Berman conceived the idea of the Guest Choice Network, a front group to help advance the goals of Philip Morris' Accommodation Program while appearing to be more of a grass-roots-led effort, in 1995. Berman became head of the Guest Choice Network. Berman cites an Oak Ridge National Laboratory/Roger Jenkins study that downplays the effects of secondhand smoke. Berman is also counsel for the American Beverage Institute, which also fronts for the tobacco industry. "You'll remember that PM USA Corp. Affairs contributed $600,000 in '95 to get this Network, organized by Rick Berman, up and running. Berman is now looking for another $300,000, principally for an educational newsletter, and Corp. Affairs wants to contribute. As of this writing, PM USA is still the only contributor, though Berman continues to promise others any day now..."
Philip Morris saw Berman as a "hospitality industry insider as well as a legislatively astute individual" who could help them achieve their goal of preserving smoking in restaurants. Barbara Trach at PM wrote in an October 1995 memo that "Berman's current client list is a virtual who's who in the chain restaurant industry." Berman was introduced to Philip Morris through employees of Miller Beer, who were familiar with him and his work. Berman originated PM's strategy of broadening the focus of the "smoking issue," and "expanding it into the bigger picture of over-regulation." Berman formed a group called "Beverage Retailers Against Drunk Driving" (BRADD), a pro-social drinking group, in response to Mothers Against Drunk Driving (MADD). Jody Knauss, Walmart Wages in Perspective, PRWatch, February 20, 2015. Mary Bottari, Richard Berman Goes after Bill McKibben and Global Divestment Day, PRWatch, February 12, 2015. Jonas Persson, Phony Front Group, Center for Union Facts, to Run Super Bowl Ad, PRWatch, January 31, 2015. Lisa Graves, Rick Berman Exposed in New Audio; Hear His Tactics against Environmentalists and Workers Rights, PRWatch, October 30, 2014. Jonas Persson, Paid Sick Days for Six Million Californians to Become Law, PRWatch, September 4, 2014. Mary Bottari, Miley Cyrus Isn't against the Minimum Wage and the Employment Policies Institute Isn't a Think Tank, PRWatch, July 17, 2014. Brendan Fischer, Bradley Foundation Bankrolled Groups Pushing Back on Scott Walker John Doe Criminal Probe, PRWatch, June 19, 2014. Mary Bottari, The National Restaurant Association Spends Big to Keep Wages Low, PRWatch, May 14, 2014. Lisa Graves, Corporate America's New Scam: PR Firm Poses as Think Tank, PRWatch, November 12, 2013. Rebekah Wilce, Web of Berman Front Groups Subject of IRS Complaint, PRWatch, November 30, 2012. Anne Landman, Rick Berman's For-Profit Non-Profits Under the Microscope, PRWatch, June 21, 2010. Anne Landman, The Latest on Rick Berman, Attack Dog Extraordinaire, PRWatch, June 2, 2010. Anne Landman, Rick Berman Attacks the Humane Society, PRWatch, February 17, 2010. Bob Burton, Berman's Serious Secrecy, PRWatch, November 16, 2009. Anne Landman, Front Group King Rick Berman Gets Blasted by his Son David Berman, PRWatch, January 30, 2009. Sheldon Rampton, Berman Attacks Teachers, PRWatch, November 7, 2007. John Stauber, Rick Berman Gets His 60 Minutes of Fame, PRWatch, April 6, 2007. John Stauber, Rick Berman, Corporate Attack Dog for Hire, PRWatch, July 31, 2006. Diane Farsetta, Berman's Center for Union Smears Hits TV Screens, PRWatch, May 19, 2006. John Stauber, Lobbyists-Loot Dot Con: Berman Flees, Martosko Plays Dumb, PRWatch, May 4, 2006. John Stauber, The "Center for Union Facts" Is Rick Berman's Newest Fiction, PRWatch, February 13, 2006. Richard Berman, "Disability Act Threatens to Cripple Hospitality Industry," Nation's Restaurant News, October 9, 1989, p. F4. Richard Berman, "Animal Groups Callous, Not Cute," USA Today, April 15, 2003. Greg Sargent, "Berman's Battle," The American Prospect, January 3, 2004. John N. Frank, "ABL ups efforts slamming GM for its support of MADD", PR Week, February 28, 2005. (Sub req'd). Nancy Goldstein, "Biting the Hand that Spins You," PageOne, March 17, 2005. Caroline E. Mayer and Amy Joyce, "Nonprofit's Tactics, Funding Sources Spark Controversy", Washington Post, April 27, 2005. Melanie Warner, "Striking Back at the Food Police", New York Times, June 12, 2005. Seth Lubove, "Food Fight," Forbes, September 23, 2005. Aina Hunter, "Mercury in Fish? Baloney! : Lobbyist tells pregnant women to eat more tuna", Village Voice, January 17th, 2006. Harold Meyerson, "Our Pious Babylon", Washington Post, April 6, 2006; A29. Mark Matthews, Lobbyists Hide Behind Non-Profit Fronts, KGO TV, San Francisco, CA, May 3, 2006. Jayne O'Donnell, "Got a nasty fight? Here's your man", USA Today, July 31, 2006. Sam Stein, "Bailout Recipients Hosted Call To Defeat Key Labor Bill", Huffington Post, January 27, 2009. BermanExposed.org, Citizens for Responsibility and Ethics in Washington. ↑ Morley Safer, Meet Rick Berman, A.K.A. "Dr. Evil," CBS News "60 Minutes," July 22, 2007. ↑ Tim McCown, Richard Berman coming to Astro-turf your rights away, Philadelphia Progressive Examiner, September 24, 2009. ↑ Sheldon Rampton and John Stauber, Berman & Co.: "Nonprofit" Hustlers for the Food and Booze Biz, PRWatch, first quarter 2001, Volume 8, No. 1. ↑ Steven Greenhouse, Advocates for Workers Raise the Ire of Business, New York Times, January 16, 2014. ↑ Tobacco Library, Secondhand Smoke in Bars and Restaurants Falls Well Below OSHA Standards, ABI Testifies Group Cites New Research from Oak Ridge National Labs, PR Newswire, February 23, 2003, accessed May 24, 2013. ↑ Center for Consumer Freedom, 2012 IRS Form 990, organizational annual IRS filing, November 8, 2013, p. 7. ↑ Center for Consumer Freedom, 2005 IRS Form 990, organizational annual IRS filing, November 13, 2006, Statement 11. ↑ Jayne O'Donnell, Got a nasty fight? Here's your man, USA Today, July 31, 2006. ↑ 11.0 11.1 11.2 11.3 11.4 Mary Bottari Bradley Foundation Bankrolls Front Groups of Discredited PR Spin Doctor Richard Berman, Exposed by CMD, May 9, 2017. ↑ Matt Corley, Infamous for Keeping Clients Secret, Berman Admits to Advising Monsanto on GMOs, Citizens for Responsibility and Ethics in Washington, May 18, 2016. ↑ 15.0 15.1 Noel Brinkerhoff, Who’s behind the Movement to Sell off Public Lands?, AllGov, April 8, 2015. ↑ Senate Bill Clerk, U.S. Senate Roll Call Votes 114th Congress - 1st Session, United States Senate, March 26, 2015. ↑ Will Coggin, Look at funding for groups opposed to federal lands transfer, Helena Independent Record, April 2, 2015. ↑ Will Coggin, Public Lands Debate Marred by Camouflaged Activists, Fairfield Sun Times, March 31, 2015. ↑ Will Coggin, Nevadans should have say on land management policy, Las Vegas Review-Journal, March 31, 2015. ↑ Will Coggin, Will Coggin: Public lands debate marred by camouflaged activists, Deseret News, March 31, 2015. ↑ Sean McCoy, Senate Vote: Amendment Sanctions Sale Of National Forests, Public Land, GearJunkie, April 6, 2015. ↑ Claire Moser, How The Oil Industry's 'Dr. Evil' Is Running A Campaign To Sell Off America's Public Lands, Climate Progress, April 6, 2015. ↑ Berman & Co., Wisconsin Could Be a Tipping Point for Employee Rights, LaborPains.org, March 9, 2015. ↑ Richard Berman, Employee Rights Act truly gives workers a voice, Las Vegas Review-Journal, February 4, 2015. ↑ Richard Berman, Employee Rights Act doesn't make 'reactionary' reforms, The Hill, January 5, 2015. ↑ Newt Gingrich, Gingrich: Employee Rights Act should be new Congress' priority, The Des Moines Register, November 13, 2014. ↑ Richard Berman, The Employee Rights Act would reduce union exploitation of workers, The Washington Times, January 4, 2015. ↑ Newt Gingrich and Rick Berman, Voters clearly want Congress to protect employees from unions. Here’s where it can start, Washington Post, December 16, 2014. ↑ Richard Berman, Union 'comeback' a wishful myth, The Shreveport Times, February 10, 2015. ↑ John A. Logan, What to expect from labor policy in 2015, The Hill, December 31, 2014. ↑ 31.0 31.1 31.2 31.3 31.4 Suzanne Goldenberg, Lobbyist dubbed Dr Evil behind front groups attacking Obama power rules, The Guardian, February 23, 2015. ↑ 32.0 32.1 32.2 32.3 Mark Drajem, Fracking Advocates Urged to Win Ugly by Discrediting Foes, Bloomberg, October 30, 2014. ↑ Lisa Graves, Rick Berman Exposed in New Audio; Hear His Tactics against Environmentalists and Workers Rights, PRWatch.org, October 30, 2014. ↑ Richard Berman, Transcript of speech to oil and gas executives, June 2014, published by New York Times October 30, 2014. ↑ 60 Minutes, Meet Dr. Evil, CBS News, September 19, 2007. ↑ Confronting Rick Berman, MSNBC "The Rachel Maddow Show," accessed April 2, 2013. ↑ Citizens for Responsibility and Ethics in Washington, Berman Exposed, organizational website, accessed April 2, 2013. ↑ Ian T. Shearn, Humane Society of the United States, Investigative Report: CCF's Richard Berman, organizational report, May 11, 2010. ↑ Bloomberg News, Anti-Union Group's Ads Attack Organized Labor, Los Angeles Times, February 14, 2006. ↑ Louis Jacobson, "Tanks on the Roll," National Journal, July 8, 1995, p. 1767. ↑ 41.0 41.1 41.2 Charles Bernstein, The Zealot, Chain Leader, December 1999. ↑ Foodservice Blog, Who's gonna make us?, Nation's Restaurant News blog, September 16, 2007. ↑ Elizabeth Flock, PETA and Humane Society attacked by reports - are they real?, The Washington Post, February 27, 2012. ↑ Campaign for a Healthy Denver and Restaurant Opportunities Centers United, The National Restaurant Association: Behind the Fight Against Working Families and an Economy that Works for All, organizational report, October 2011. ↑ Marcus Kabel, Wal-Mart denies critics' claim that retail giant backs anti-union group, The Seattle Times, March 26, 2006. ↑ Richard B. Berman, Richard B. Berman Resume, document archived in the "Legacy Tobacco Documents Library," January 1995, Philip Morris Bates No. 2072148764. ↑ Lisa Graves, Corporate America's new scam: Industry P.R. firm poses as think tank!," Salon.com, November 13, 2013. ↑ Arturo Garcia, Chris Hayes clashes with conservative 'think tank' member: 'How many economists do you have on staff? '," The Raw Story, November 14, 2014. ↑ Employment Policies Institute, Obama's Broken Promises: Kentucky, organizational ad campaign, YouTube, announced September 8, 2014. ↑ Employment Policies Institute, Minimum Wage Ad, Politico, September 10, 2014. ↑ 54.0 54.1 Jennifer Liberto, "Big business hits back on minimum wage," CNNMoney, February 21, 2014. 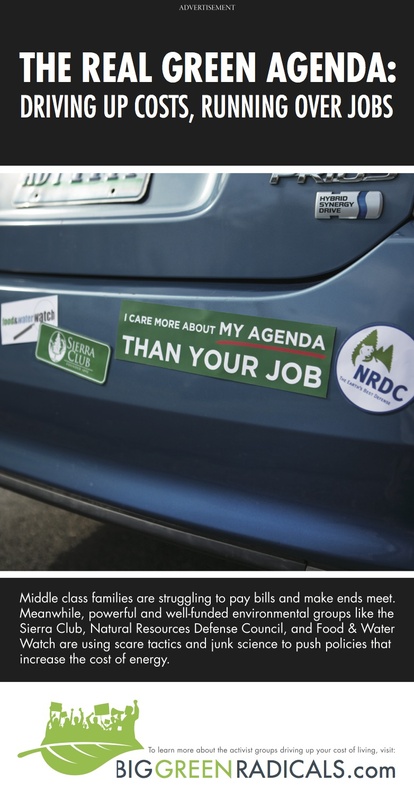 ↑ Big Green Radicals ad, Wall Street Journal, March 6, 2014. ↑ Darcey Rakestraw, Food & Water Watch, Rick Berman Strikes Again With Environmental Policy Alliance, organizational blog, March 6, 2014. ↑ 66.0 66.1 Center for Responsibility and Ethics in Washington, Burned by Berman: A Special Interest PR Campaign Gone Wrong, CitizensForEthics.org, accessed July 17, 2014. ↑ James Bowers, Media sending mixed messages about health, Denver Post, March 16, 2008. ↑ Catherine Saint Louis,FDA Announces Stricter Rules On Tanning Beds, New York Times, May 29, 2014. ↑ Melanie Warner, Striking Back at the Food Police, New York Times, June 12, 2005. ↑ 78.0 78.1 78.2 Berman & Co., Rick Berman, PR firm biography, accessed September 2014. This page was last edited on 5 January 2018, at 16:09.